I happen to be in New York City this week for some business meetings. At the end of a long day, I stopped off at the bar in the hotel I am staying at to have a drink. I found another business person at the bar, and we started chatting about business. It turns out that he owns a company that produces spray paint. Not your everyday spray paint however, this is spray paint for graffiti artists. Talk about your narrow market segment. It turns out this is not some small back of the paint store market, but a major niche with many competitors, a large number of targeted magazines, even conferences. It really started me thinking about how the web has really been a boon to these micro segments. It has created entire marketplaces for products that once would rarely have never made it into distribution because of their lack of a critical mass of customers. It also got me to thinking how many more of these microsegments exist out there just waiting for someone to come along and serve them properly. The nice thing about web marketing is that the segment will often identify itself, long before we as marketing people might find it. It just takes keeping a keen eye on the horizon for these types of opportunities. Now the best part about this story. It turns out that the graffiti paint this fellow’s company makes is so far superior to the standard Rustoleum type of stuff you pick up in your average hardware store, that the hardware stores are now embracing the products from the micro segment, and turning them into mainstream product. True Value and other leading hardware stores will soon have his product (Plutonium G) on stock for your more serious home projects. You should definitely check out the company’s web site to see how serious marketing graffiti paint is. 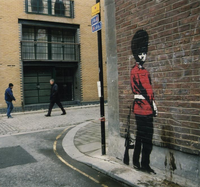 By the way the image above is of graffiti painted by famed artist Bansky. He is famous for his beautiful and sometimes attention grabbing work. Check in out on his web site. I am constantly looking for unique niche markets and this post really does illustrate how important it is to keep an eye on the horizon for new opportunities. Micro Niche martkers come up with all kinds of intersting an innovate ways to promote themselves, which is often even more interesting than the products they sell.